I have a client whose data is large enough that their cube needs to be partitioned monthly. This process needed to be automated. I would like to thank Vidas Matelis for posting the scripts he used to do this, here. I started with his scripts and changed a number of things to get it to work in my environment. This is done in SQL 2008. Here is how it works. 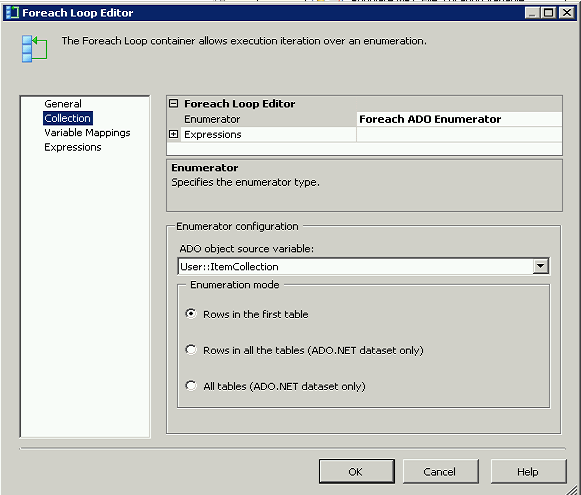 This is the first container in the package, which simply populates the tables created in step 1. 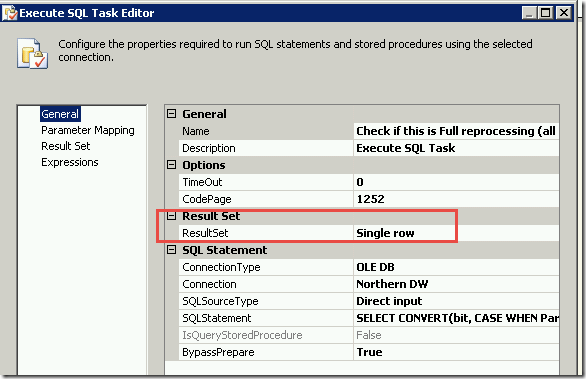 Add these Execute SQL Tasks to your SSIS package. 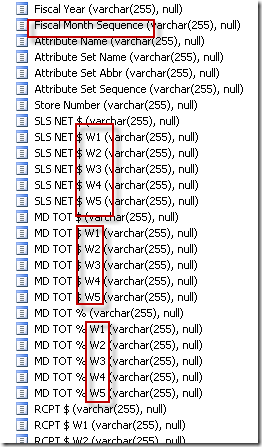 Below you will find some examples of rows to be inserted into the SSASPartitionsBase table. This table is used as the base for building out the partition definitions. You will need one record for each measure group in your cube, regardless of one or many partitions. 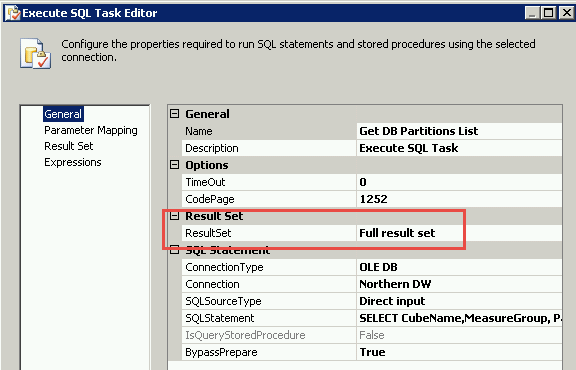 If you will require multiple partitions for a measure group, you must populate the PartitionFieldName and the TableStartDateKey so the script will know what SQL to write to define the partitions. 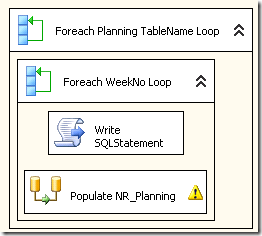 If you are pulling data into your cube using a query rather then directly from a table you must enter it here. 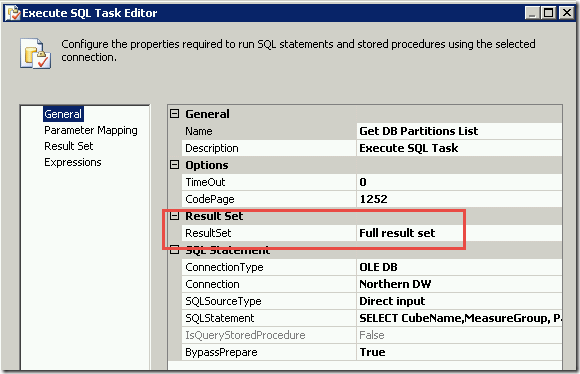 You may want to use LoadType if you will be defining different partitions for different data sets. 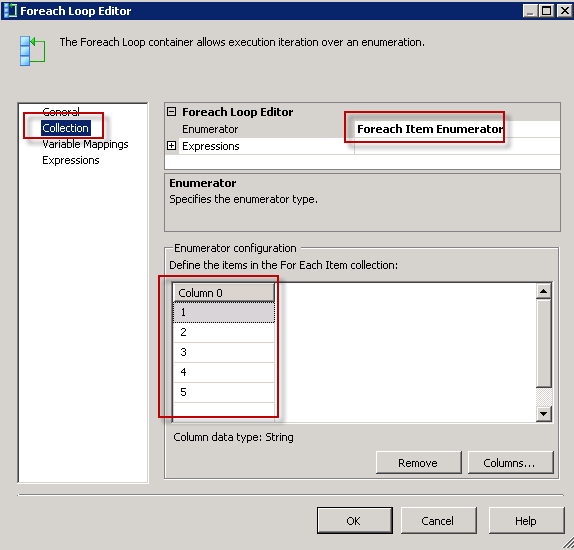 I am not using this because any of my measure groups that need multiple partitions will use the same periods for the partitions. 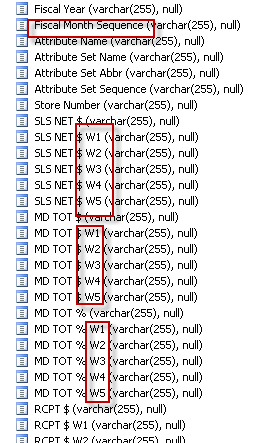 This will become clearer when we look at the Stored Procedure which populates the SSASPartitions table. 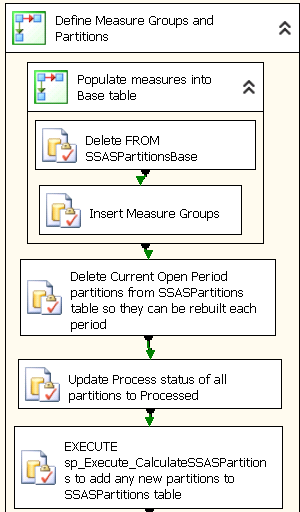 Because I have other SSIS packages that process the Open Period during the week, I need to have one partition in each multi-partition measure group that has a consistent name. I have a naming convention like “Sales Current Open Period” or “Inv OH Current Open Period”. The definition of the Current Open Period changes periodically, as a new monthly partition is created. For example I might have a Current Open Period of Nov 1 to current day. Let’s on November 30 a partition is saved off and the Current Open Period becomes Dec 1 to current day. The Current Open Period partition needs to be dropped and recreated each time the script is run, to be sure that any new definition will be captured and processed. Dropping it from the SSASPartitions table ensure that it will be reinserted with the updated definition. Any single partition measure groups need to be reprocessed every time the script is run. We can identify these measure groups as those where MinDateKey=0. This task flags these single partition measure groups to be processed. 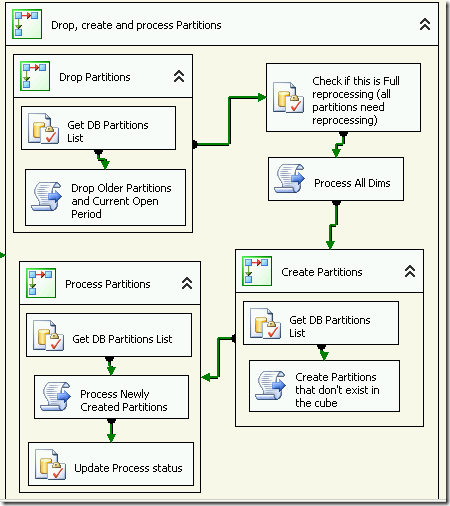 This stored procedure kicks off a stored procedure which adds any new partitions to the SSASPartitions table. 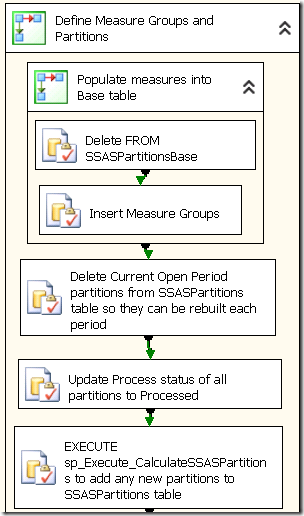 This is the stored procedure which uses the SSASPartitionsBase table to populate the SSASPartitions table. -- Safety. If we miss any measure groups, add records as if they were not partitioned. This is the second and final container that uses the information created in the first steps to actually drop, create and process any partitions which are new or which need to be reprocessed.
' 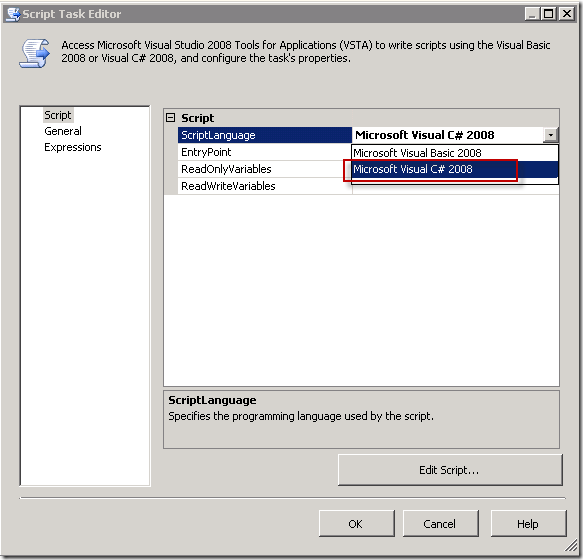 Write scripts using Microsoft Visual Basic 2008.
' The ScriptMain is the entry point class of the script.
' 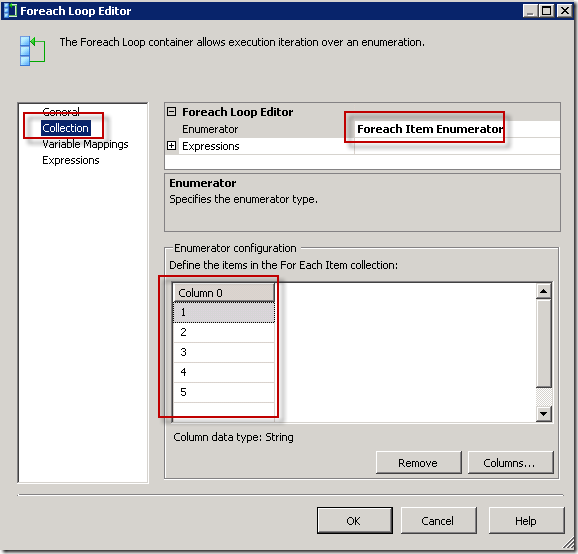 The execution engine calls this method when the task executes.
' and logging features are available as members of the Dts property as shown in the following examples.
' cm.ConnectionString = "Data Source=localhost;Initial Catalog=AdventureWorks;Provider=SQLNCLI10;Integrated Security=SSPI;Auto Translate=False;"
' Before returning from this method, set the value of Dts.TaskResult to indicate success or failure.
' To open Help, press F1. Dim PartListInDM(999, 2) As String ' expecting no more than a 1000 partitions. bMatch = strPartition Like "*Current Open Period*"
'Iterate through each partition in the table and check if it exists in the cube already. This will check to see if the full cube will be reprocessed, or just some of the partitions. This will always process all dimensions.
' Dim sProcessType As String = "ProcessFull"
Dts.Log("Will be doing FULL dimension processing", 0, dataBytes) ' You need to setup proper package loging to see this! Dts.Log("Will be doing UPDATE dimension processing", 0, dataBytes) ' You need to setup proper package loging to see this! oServer.CaptureXml() = True ' Start capturing XML.
' This will generate XMLA, but because CaptureXML is True, will not execute it!
' These are very important parameters! Indicate that all the partitions have been processed. Thanks again to Vidas Matelis. His scripts, here, were invaluable. This is a situation where the data from a number of tables with the same structure needs to be imported into a single table. 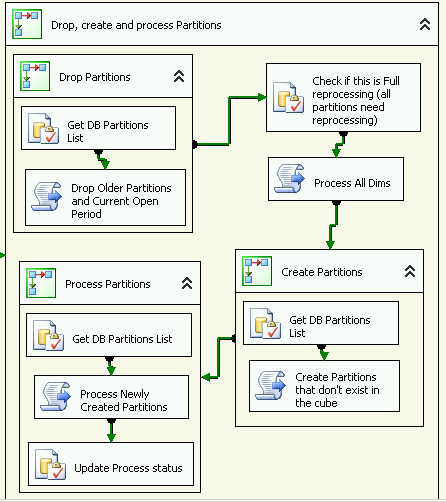 Rather than hard coding multiple data flows from source to destination, you can loop through each SQL statement using a single data flow by building a dynamic SQL statement. This simple package loops through each table name to accomplish just that. It also has a secondary loop to pivot some hard coded week numbers in the field names. The data source is a series of tables with the same structure. Each one holds a different set of planning data. 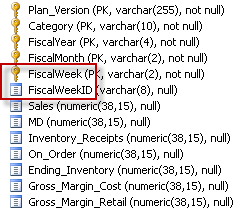 The fields have the fiscal month hard coded into the name, rather than have Week Number as an attribute. The destination not only needs to map multiple tables to a single table, but it also needs to pivot the fiscal month weeks. To accomplish this I hard coded the table names into the For Each loop, but an object variable could just as easily done this. 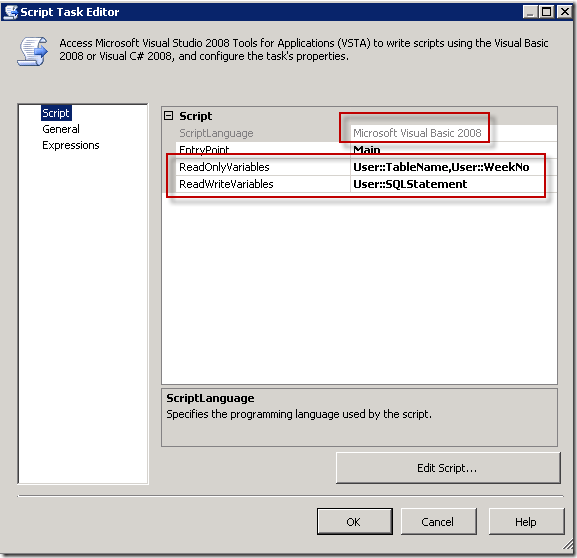 In the script portion, write a simple script which uses the variables and embeds them in the SQL statement you are writing. 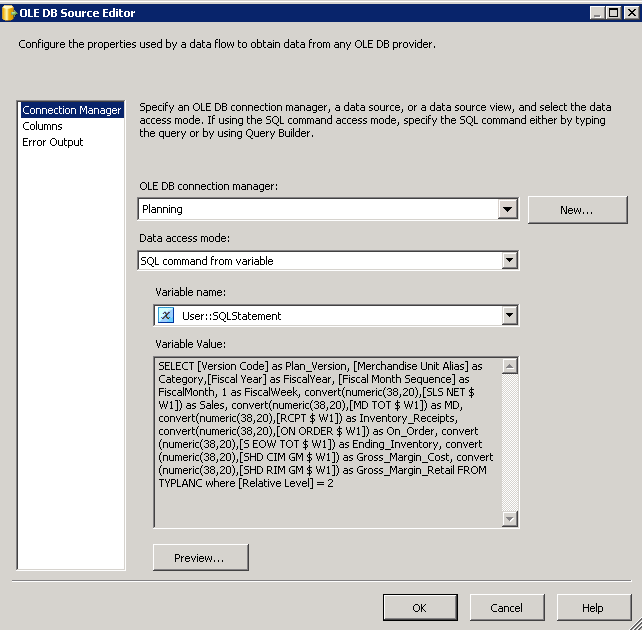 This outputs to your SQLStatement variable to be used in the data flow. 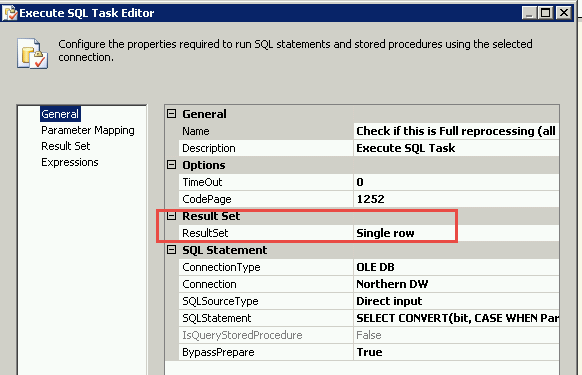 To set up the data flow, you must first enter a valid SQL Statement in the SQLStatement variable. Your variable will then be replaced with a new one during each loop. 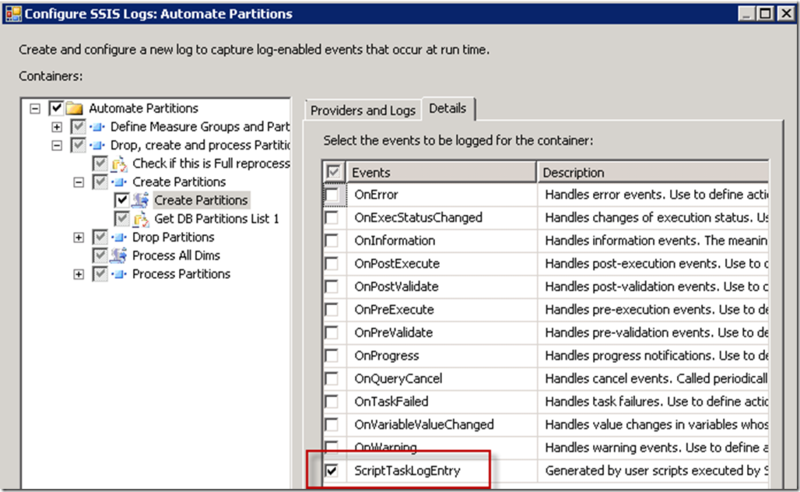 At times I like to capture certain errors and events that occur in a Script Task in an SSIS package, and include them in the package logging. In order to make this happen simply include the appropriate statements in your Script Task and turn on some custom logging within the package logging configuration. 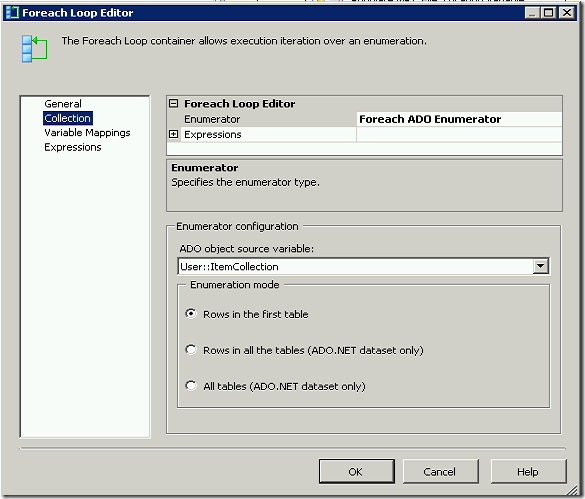 In order for this message to be included in the [sysssislog] table simply right click on the package Control Flow surface, and select Logging. Within the Containers window, drill down to your Script Task. Check the box beside the Script Task until it has a black check mark, instead of a greyed out check mark. In the Providers and Logs tab select the log you want to write to. On the Details tab select the Events you wish to log, and be sure to select the ScriptTaskLogEntry. Click OK and you’re done. Your custom messages will be included in the package logs. 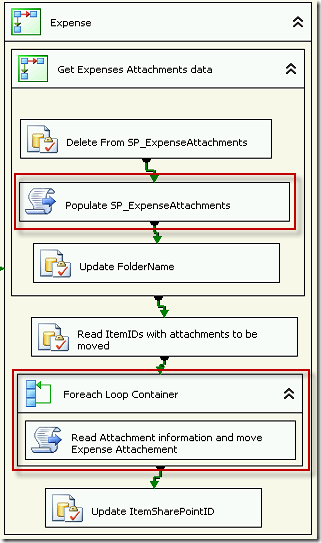 You’ll want to read my previous post Moving SharePoint List Attachments to the File System, to get all the details and requirements for setting up and running these SSIS script tasks. 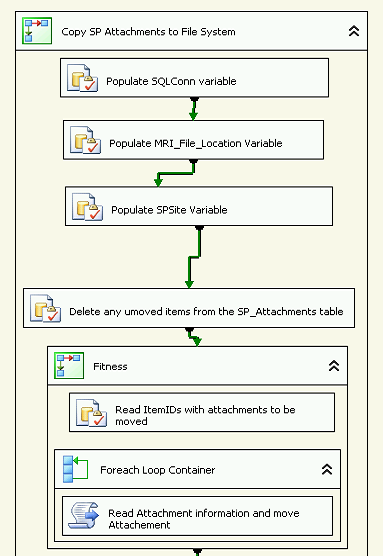 This is an SSIS Package code which will iterate through the document library to get some relevant information about the documents, and then move specified documents from a document library to the file system. I will just explain the two script tasks steps, as the rest will be specific to your task. 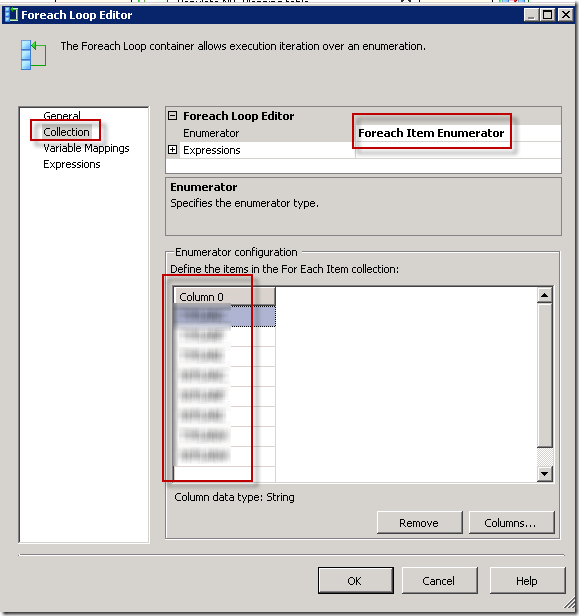 The execution engine calls this method when the task executes. and logging features are available as members of the Dts property as shown in the following examples. 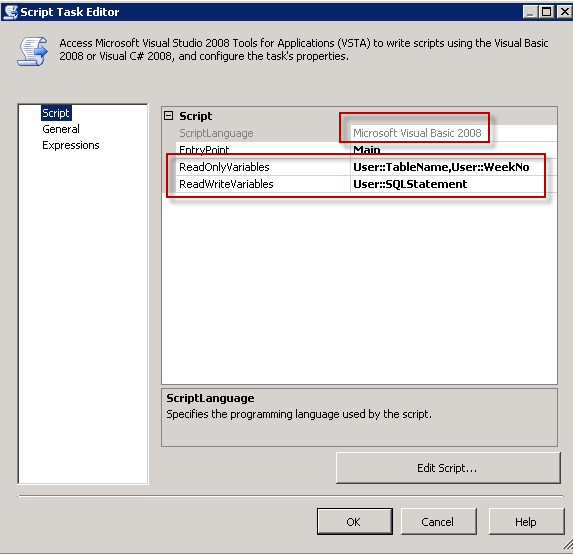 Before returning from this method, set the value of Dts.TaskResult to indicate success or failure. To open Help, press F1. This code accepts a document id from a variable, populates some relevant information about the document into a SQL table and copies and renames the document to the file system. 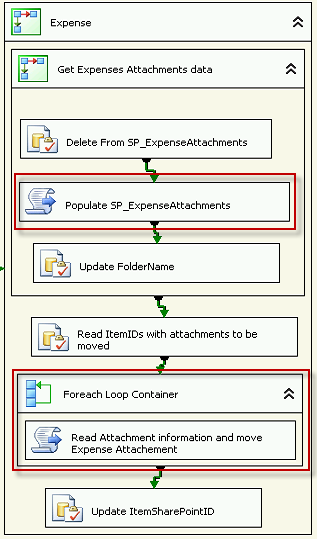 You can use a Script Task in SSIS to move SharePoint list attachments to the file system. This C# code references the Microsoft.SharePoint assembly. It’s very important to note that the the SharePoint attachments have to be on the same server that the package is running on. 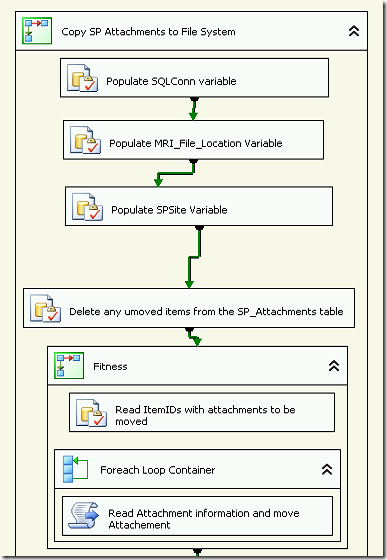 Thes means that the package can only run on SSIS installed on the SharePoint box where the attachments are. You will need to install SSIS and the corresponding msdb database on your SharePoint server if it isn’t already installed. Most of the these tasks are self explanatory and you’ll need to set up your own tables and logic to accomplish the goals of your package. You’ll want a table that tells you which items have attachments. 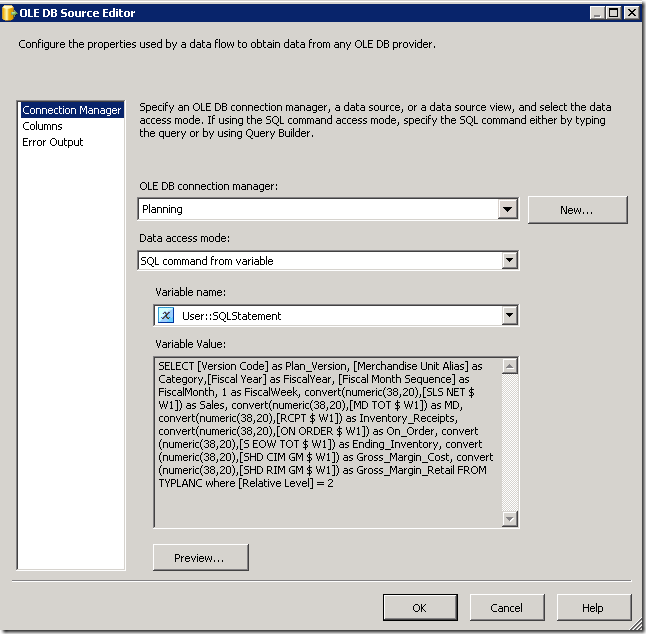 See this post for details on how to import data from a SharePoint list. Attachments is one of the fields you can import, which is simply a bit that says whether or not the list item has any attachments. 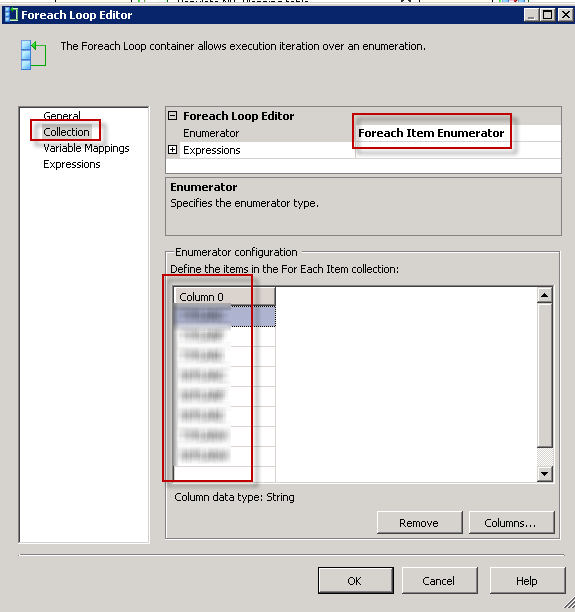 Further to the series of posts on importing data from Active Directory, I’ve run into a new issue. For this client I built the exact same solution as described here Getting Around Active Directory Paging on SSIS Import, but got this lovely error message: “Index was out of range. Must be non-negative and less than the size of the collection.” It turns out there were empty values in some of the single-value fields. I hadn’t run into this previously, but I found a neat solution. 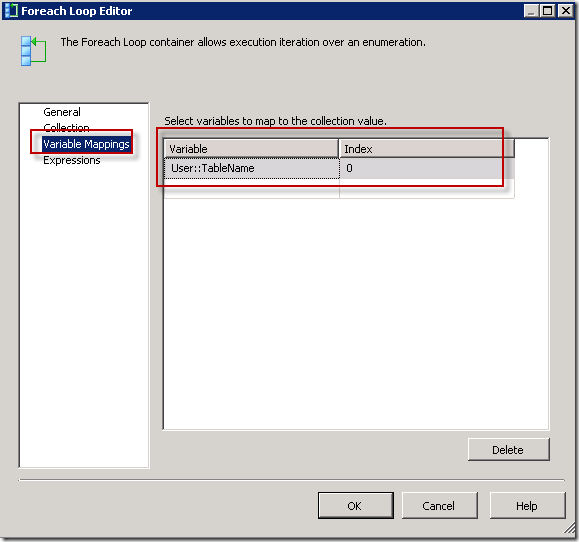 In the original solution I outlined how to create a simple SSIS script task in C# to import single value fields from Active Directory. I’ve added to this code to create a solution to import empty single-value fields. Here is the complete code. 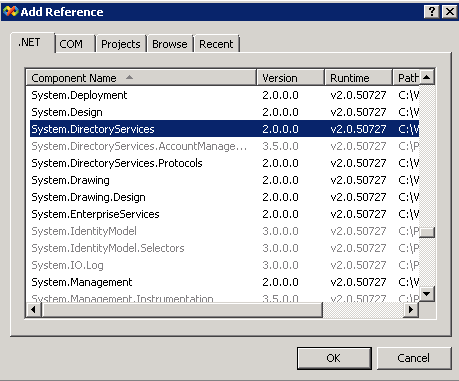 for more details on how to create the SSIS package and set up the references for the script task, please see Getting Around Active Directory Paging on SSIS Import. Apparently what’s even more difficult than importing data from AD is figuring out how to import multi-value objects from Active Directory. “Description” is an example of a standard AD multi-value field. My client had many custom multi-value fields added to AD and needed to import the data from these fields into tables in a database. You can accomplish this easily this by adding a bit of code to the C# code importing the single value attributes as outlined in my previous post Getting Around AD Paging on SSIS Import. This C# code is much simpler than trying to import each multi-value field using a Data Flow task. Using Data Flow tasks can be done but it has some tricky problems like importing only those records with values in the multi-value field, working around paging, and how to deal with apparently empty objects that your query returns even though you specified that it only return those objects with values. It’s also quite a bit slower as you need to populate variables and pass those variables to loops to iterate thru the multi-values for one account at a time. Here is the code for importing one multi-value attribute into a table. 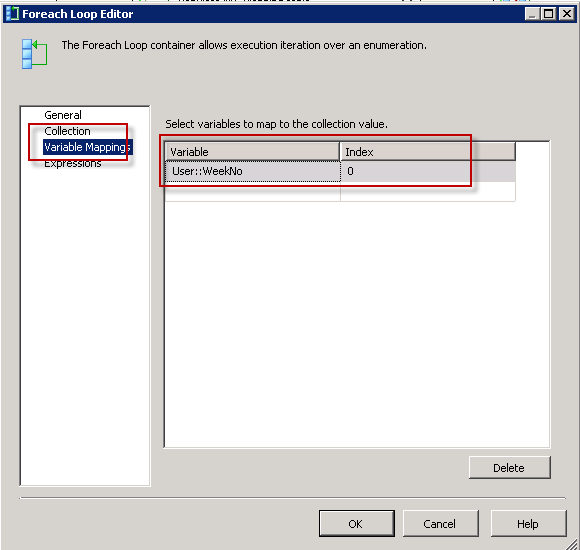 This code should be placed at an appropriate spot within the “foreach (SearchResults” loop outlined in the Getting Around AD Paging on SSIS Import post. The nice thing about this code is that you can iterate through any records, even if the multi-value field is empty. It won’t fail, it just won’t return a record. This means you can add this same chunk of code multiple times edited for several different multi-value fields within the same script task, and have all your tables updated using the same script. The package is very easy to maintain, with no package variables, no complex package logic, just a simple script. Very elegant! 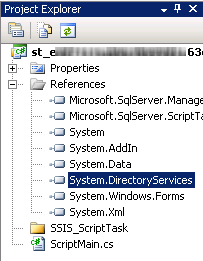 I have a client who is importing certain users from Active Directory. The paging on their AD is set to 20,000 records. When trying to pull data using a SQL statement, the query fails because it hits the maximum number of records and is unable to return more. You could work around a problem like this by editing your query filter to ensure that you always retrieve fewer than 20,000 records at a time, for example using the whenCreated field. However, there is no guarantee that whatever filter you use will always limit your return value to a maximum of 20,000 records. And you now need to build a loop construct to retrieve all the records since you want more than 20,000 records. This is much easier to solve than you might think, judging from the number of forum questions out there on the subject (and how long it took me to piece it together). Here are the steps. Add a string variable, scoped to the package, called SqlConn. 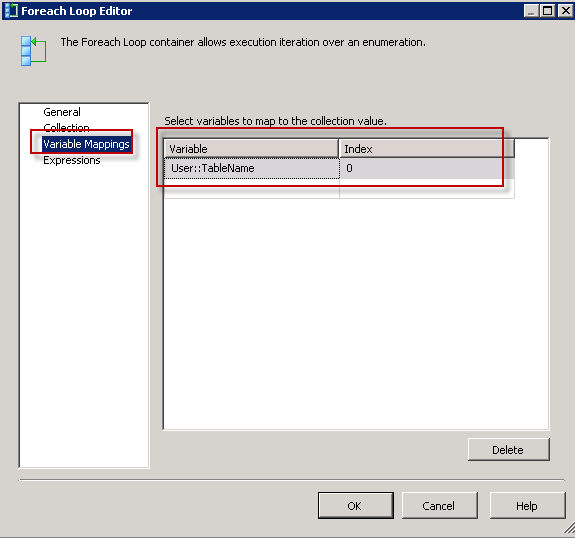 Populate it with the connection string to the database you want to populate with the AD records. Add a script task to your package. 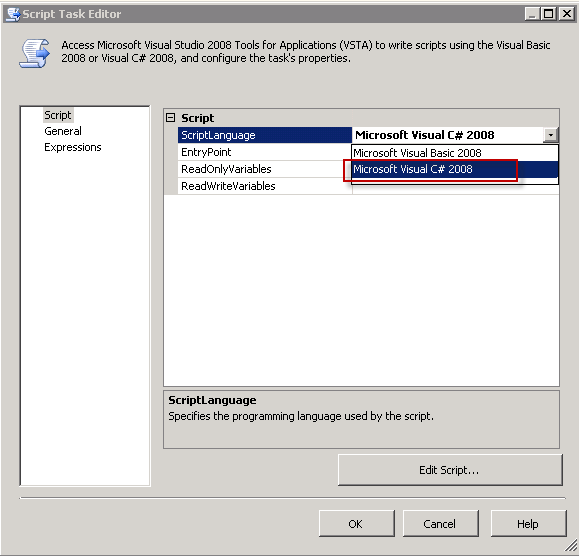 Open the script task, making sure that the ScriptLanguage is C# and not VB. Click on the Edit Script button. On the right hand side you should see the Project Explorer window. 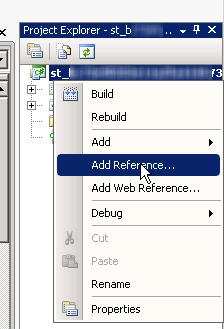 Right click on the name of the Project File at the top of the tree and select Add Reference. 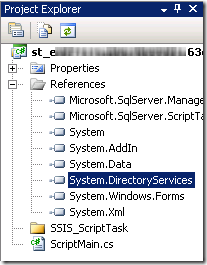 On the .NET tab scroll down and find System.DirectoryServices. 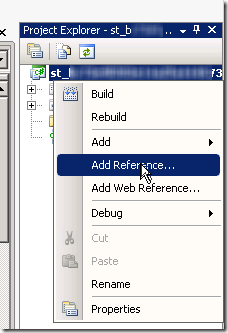 Select it and click OK.
Make sure you see the reference appear in the References folder in the Project Explorer window. Add these statements at the beginning of your script. Paste this script to replace the public void Main(). Edit the ds.Filter and Insert string values to meet your table requirements. Be sure to only select single value attributes of the object. If you try to use this method to import multi-value attributes such as “Description” from AD it won’t work. I’ll be writing about that next. That’s it. 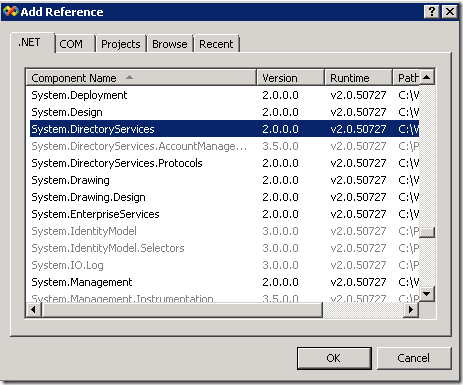 This will iterate through all of the objects in Active Directory, regardless of paging size set on Active Directory.